How many holiday days do you get in a year? Twenty, perhaps twenty-five if you’re lucky? That two week holiday takes up a large chunk of your precious days off, and is one of your biggest expenses of the whole year. So it’s important that you plan your holiday right. Hold up; don’t open the brochure yet! 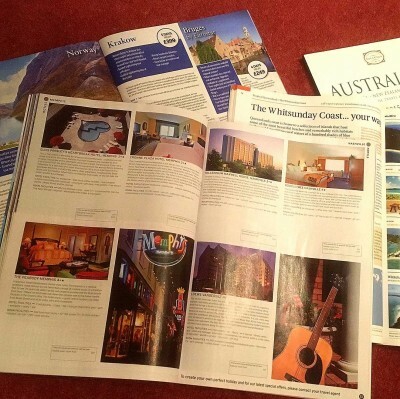 It’s easy to dive straight in to the holiday brochure you used last year and start sifting through hotels. Sure, hotels are an important part of your holiday, but don’t centre your holiday choice on a hotel. There are other considerations to make first. If you follow the same path you always take then you don’t give yourself the opportunity to find a more unique or alternative trip. Let’s start with a blank canvas. Travel journalism is often more focussed on the experience of the destination rather than holiday brochures which are focussed on what they can sell you. The travel sections of the broadsheet newspapers offer plenty of inspiration for your blank canvas. Another source of inspiration and they usually offer first-hand accounts of their own experiences (as a footnote, be wary of sponsored posts that can be biased in favour of the company or tourist board who paid for the trip. This is normally stipulated in the blog). If you’re not already, get yourself on Pinterest. Search a few places you’ve considered but know very little about. Images are so much more helpful at getting a feel for a place. This may not work for everyone, but it can be a really useful exercise if you are either a) completely overwhelmed with the options, or b) looking for another angle to come up with original ideas. You can do this for previous holidays, experiences, days out with friends. Think about the memories that stand out in your head. This is perhaps a rather simple example but it gives you a good idea of how it can work. There are a number of destinations I can think of that would fit these criteria, but this is a great starting point. Once we add in the time of year (to check on weather patterns) and a budget, then we can probably narrow it down to 2 or 3 great options. What I like about this process is that you potentially open yourself up to new destinations you may not have considered before. When you do eventually start to look at hotels, remember that the larger tour operators will often focus on a lot of the same well-known and larger hotels. These are often hand-picked, reliable, good choices; however you can sometimes miss out on the smaller gems. Smaller hotels mean less rooms and that lack of capacity can prove a bit of a headache for a larger operator. With a bit of research you can find some amazing places to stay that perhaps offer a unique, more authentic experience. On that note.. Some people who work in travel hate Trip Advisor. That’s because they can’t control it. Perhaps those people shouldn’t be trusted?! Don’t get me wrong, of course the best hotels in the world sometimes get negative reviews. Of course customers can have unreasonable expectations. Of course members of staff can have bad days. But I don’t know anyone that listens to a 1 star review when everyone else has given the hotel 4 or 5 stars. Trip Advisor is great, but it’s one small part of a bigger picture. My advice, and you can take it or leave it, is to give your comfort zone a little push every time you go on holiday. Scare yourself a little. The slightly crazy things that I have done travelling around the world have by far been the things that stand out in my head as great memories. That doesn’t mean jungle trekking through Uganda (though I’ll help you do that if you want to!) It could just mean taking a surfing lesson or perhaps riding a bike through paddy fields. Your comfort zone is unique to you, but trust me, a little nudge once in a while does wanders for your life memories and your confidence! How about a Group Tour? I know what you’re thinking; tour guide holding an umbrella, a coach load of people being horded around, barely getting time to take a photo before they’re back on the bus again. Yes, group travel can be like that, but it doesn’t have to be. I know group tours that have been just 8 people and one of the modes of transport was a tractor! Tour companies understand that today people crave genuine experiences. We want to get a real feel for what life is like in a country. We don’t want to be behind a smokescreen, or to see some kind of dumbed-down showpiece of a country’s traditions. If you’re comfortable with the idea of taking a packed local bus, sharing it with chickens, you’ll find a tour company that can give you this experience with an experienced local guide. If you need a little more comfort, that’s fine too. So here’s where I’m supposed to tell you to always use a travel agent, right? Well, that would be a bit hypocritical of me since I’ve booked plenty of hotels online! I guess this one goes without saying. Shopping around can save you money, and often your preferred agent or operator will match your best price too. A word of caution here though; if a large operator is using the “the pile ‘em high, sell ‘em cheap” technique then this is generally only possible by scrimping on the customer service. If you want quality then I’m afraid you’ll have to be willing to pay a bit more. There is no advantage in driving your favourite travel agent out of business. Remember that your perfect holiday is different to the next persons. Sure, be open to advice, but don’t be told that you MUST do it this way or that. It’s all subjective. Start with a blank canvas, get inspired, research your ideas, find the best way to book, and have fun!